Brightstripe is a social enterprise and Community Interest Company (CIC) who organise cultural and sporting events and activities throughout Herefordshire. Interested in more information about the marketing strategy for this project? The Nth Degree Marketing and Design certainly know their stuff, they gave us confidence to implement our ideas and steered us through a complex process successfully, we now have a new website we are very proud of, it’s just what we asked for. The toolkit The Nth Degree has given us is very thorough and has enabled and empowered us to help ourselves. We couldn’t have done it without their support and guidance and professional approach. The Nth Degree were part of a consortium that developed a marketing strategy, brand guidelines, website and online software. Brand guidelines, collateral and a website were created to reflect the new positioning and key messages for Brightstripe – developed by marketing strategist, Dynamic Heart, after extensive research. Dynamic Heart led all the key stages of the project to ensure everything was consistently aligned to Brightstripe’s marketing strategy. The brand guidelines, collateral and website design were created by independent designer, Graeme Stoddart. 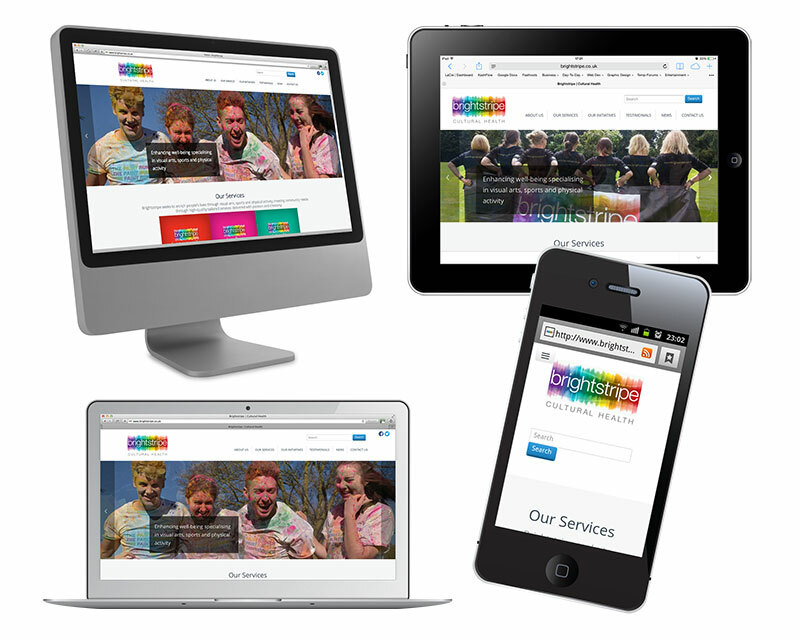 Parent website built with bespoke design by Graeme Stoddart in WordPress. WordPress was chosen as it’s a well known Content Management System (CMS) and blogging platform. Responsive design for mobile devices. Library of short videos in the site’s admin area are available to show Brightstripe’s team how to use WordPress correctly. Professionally written copy in a consistent tone of voice that conveys the key messages in the marketing strategy. 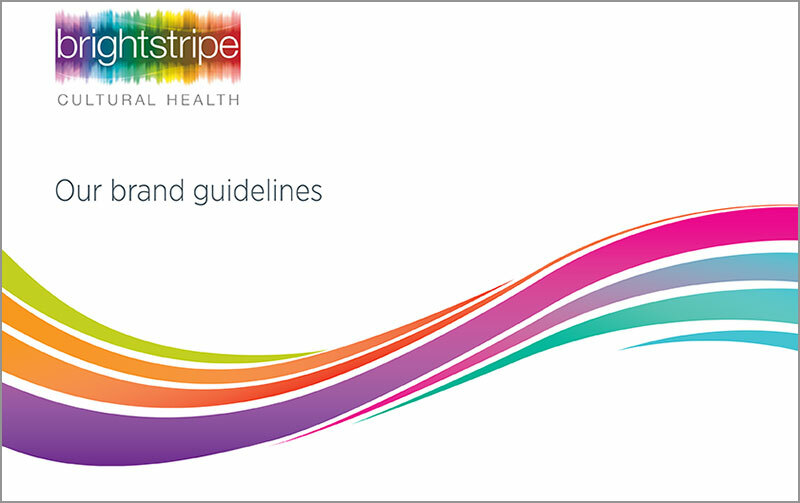 In response to Brightstripe’s staff and customer feedback, we developed a bespoke online software and a publishing solution for Brightstripe to remove manual administrative and publishing processes which were time consuming and inefficient. View the 3 minute demo below for a demonstration. Sister website built (for Herefordshire Art Week) on the Django platform. Artists can promote their work on the website. Profiles (images and copy) are submitted and edited by the artists. Event co-ordinators submit images and copy for event adverts in the printed guide. Co-ordinators check and approve their advert online before final submission. Advert copy fields on the website have character limits to ensure copy fits the selected advert size. 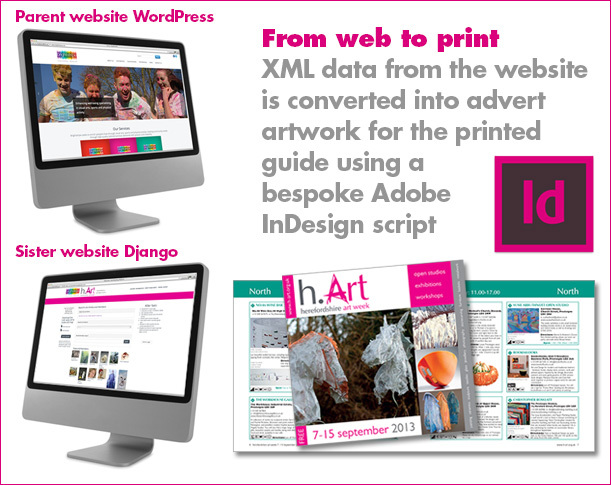 XML data from the website is converted into advert artwork for the printed guide using a bespoke Adobe InDesign script. Script creates an individual Adobe Indesign document to the exact size of the purchased advert and contains all the copy, information and images as submitted by the event co-ordinator via Brightstripe’s website. Advert images are pulled off the server onto the designer’s workstation for artwork creation. Publishing solution significantly reduces the time spent preparing the adverts and printed guide – no more spreadsheets, email attachments, alterations, editing and countless proofs!